Unspoiled white sand beaches, long hot days, fabulous coral gardens and the friendliest hosts in the world, are just a few of the things the island nation of Fiji is famous for. The spirit, culture and beauty of Fiji will captivate you. As a final destination itself or as a stopover en-route to Australia or New Zealand, Fiji is the perfect antidote to the pressures of everyday life. The nonstop flight schedule is limited from Los Angeles and San Francisco, contact us, or if you'd prefer arrange an appointment in our midtown New York office. In partnership with an Aspire Down Under consultant tailor your dream itinerary. 10 Days/7 nights: Journey to Fiji's unspoiled North, the Island of Taveuni. From Taveuni Island you will be transported by speedboat to Matangi Private Island resort, a 240 acre Island of lush tropical jungle with a volcanic rim which encloses beautiful palm fringed Horseshoe Bay. 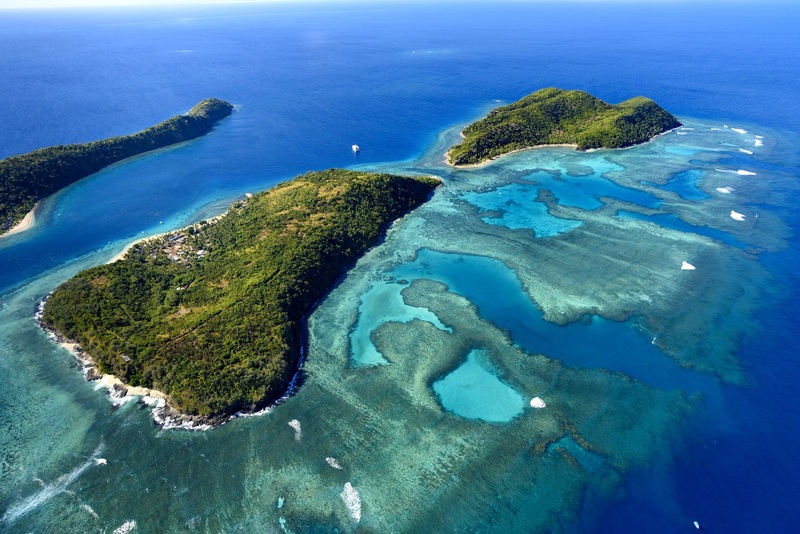 The Island is surrounded by aquamarine waters and stunning coral reefs just waiting to be explored. Spend your days snorkeling, diving, kayaking, visiting a local Fijian village, hiking or simply lying on the coconut palm-fringed beach. More..
9 Days/6 nights: Likuliku Lagoon Resort is a haven of subtle luxury and the first and only resort in Fiji with over-water bures. It is a unique and special place designed with integrity to cultural values, traditional designs and architecture, and is embraced by the renowned warmth of the Fijian people. From the water it looks like an ancient village, so traditional is the style. The beating heart of the Resort is a magnificent building in the design of a Fijian canoe house. Surrounded by sprawling ceilings, hand-woven thatch and an exotic mix of natural materials and modern elements, Likuliku embodies the richness of an ancient culture with vibrant present-day lifestyle touches.. More ..
10 days/7 nights: InterContinental Fiji Golf Resort and Spa is located on the beautiful and picturesque Natadola Beach on Fiji's main island of Viti Levu. Relax, indulge at the spa or play golf at Fiji's finest course. Fly north to Savusavu and experience Savasi Private Island. Offering all the iconic elements of a unique tropical life style, set in the turquoise waters of the Koro Sea with secluded sandy beaches, sculptural limestone outcrops and interesting crevasses where beautiful ferns and unique species cling to the ancient coral walls throughout in the extraordinary terrain. More ..
10 Days/7 nights: Just a few guests can be accommodated at Royal Davui, so be prepared for an exclusive and exceptional experience from the moment of your arrival. Here the world-renowned warmth and hospitality of the Fijian people awaits you. Royal Davui Island Resort is an adults only resort, offering an ideal tropical island escape, vacation, honeymoon or wedding. More..
10 Days/7 nights: You'll feel the fusion of a contemporary and Fijian style Beachfront Bure, Beachfront Pool Bure or a Sunset Pool Villa enveloped in lush tropical gardens and complete with a unique tropical outdoor shower. Enjoy cocktails by your personal pool and tropical sunsets or stargazing from your hammock. Dine on South Pacific and Asian influenced menus, either under the palm trees, on a romantic oceanfront deck or enjoy a special evening of Teppanyaki at the award winning Oishii restaurant complimented by high quality wines from over the globe. More..
10 Days/7 nights: Unparalleled paradise awaits guests visiting the Fiji Marriott Resort Momi Bay. Located on the blue waters of Momi Bay, 45 minutes south of Nadi. Fly north to the Island of Vanau Levu and Namale Resort and Spa. The jewel that is Namale sits majestically on the edge of the Koro Sea. The magic of Namale lies in the combination of its lush and colorful landscape, luxurious accommodations and the utterly outstanding hospitality of its staff. Namale is the epitome of seclusion and privacy. More..
10 Days/7 nights - A charming, boutique resort in a truly magical part of Fiji, Nanuya is located on the same Island where the movie Blue Lagoon was filmed and is reached from Nadi by a 35 minute scenic seaplane flight or boat ride upon the Yasawa flyer. Enjoy 7 nights in this laid back paradise! Round trip airfare and daily breakfast. More..
10 days/7 nights: The Navutu Stars Resort is the only boutique resort on the secluded island of Yaqeta, with just 9 beachfront bungalows spread along 3 pristine white-sand beaches. The resort has spacious thatched-roof bungalows that combine traditional Fijian architecture with modern luxury. From Nadi by a 35 minute scenic seaplane flight or boat ride upon the Yasawa flyer. Enjoy 7 nights in this laid back paradise!. More..